MORE ABOUT DR. HOPKINS: Dr. Michael Hopkins is a Gulf Coast native originally from Biloxi, Mississippi. I completed my undergraduate degree in geology at the University of Southern Mississippi in 2010 and a Ph.D. in earth and environmental sciences at Tulane University in 2016. My graduate researched focused on understanding extensional fault growth and interaction and how that interaction is transferred to and preserved in the landscape. Since 2016, I have been on staff with the Lake Pontchartrain Basin Foundation as a geologist and GIS specialist. While at LPBF I have worked on a variety of projects. 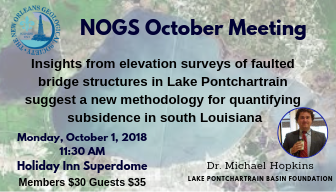 One topic that my work at LPBF has focused on is how faults contribute to subsidence in coastal Louisiana.